Artificial sweeteners are natural compounds that are used instead of table sugar and caloric sweeteners in order to sweeten food and beverages. It is estimated that an American consume about 20 teaspoons of table sugar a day, which may lead to a number of health disorders such as obesity, diabetes, arthritis, stroke, and cardiac-related problems. Here comes the importance of artificial sweeteners. Also referred to as non caloric or non nutritive sweeteners, artificial sweeteners contain no calories, and in fact are considered effective to lose weight and to remain in shape. However, an artificial sweetener is 300 to 400 times sweeter than table sugar, and hence it would be enough if you apply a small amount of it to get the same level of sweetness that a natural sweetener renders. Intake of artificial sweeteners offers a number of benefits over the consumption of table sugar or sucrose. Perhaps the most prominent among the benefits is that it is low or sometimes contains no calories at all. Another benefit is that it is effective for diabetic people, as it helps to control insulin and blood sugar levels. It also helps diabetic people to try a diverse range of menu, from ice creams and candies to pops. A continuum of dental problems such as tooth decay and gum infections is associated with the intake of sucrose, which in turn may sometimes adversely affect your overall health. But, the usage of artificial sweeteners like polyols helps to safeguard your hair from dental caries. Above all, it serves as a great choice for those people who want to lose their weight but at the same time still yearns for sweetened foods. Different types of artificial sweeteners include Acesulfame-K (acesulfame-pottasium), which is considered highly safe and used pharmaceutical items, food and beverages; Aspartame, which is made up of amino acids such as phenylalanine and aspartic acid; Cyclamate, which is used in such thermal treatments as pasteurization; Saccharin, whose usage is supported by organizations like World Health Organization (WHO); and Sucralose, which is used in a variety of foods and beverages like canned fruits, desserts, toppings, powdered and carbonated soft drinks, chewing gums, breakfast cereals, and salad dressings. What are some natural sweeteners? A natural sweetener is also a kind of sweetener that is used as a substitute of sugar. As it does not undergo any complicated processing or refining, natural sweeteners are considered a more suitable option than brown sugar and artificial sweeteners, both of which pass through processing, which in turn may destroy all essential proteins, organic acids, vitamins, nitrogen substances, and enzymes contained in the natural sugar cane. Herbal or plant-based sweeteners are one of the most popular forms of natural sweeteners, the prime example for which are Agave nectar that is extracted from the juice of Agave Tequilana and containing in it properties such as low glycemic index and honey-like taste, Stevia, which is extracted from Stevia rebaudiana – a perennial plant that is native to South America; and Maple Syrup, which is produced from the sap of maple trees. Another popular variety of natural sweetener is the one extracted from the fruits, such as Erythritol, which is found naturally in fruits such as grapes, melons, and pears, and Xylitol, a natural, low calorie sugar alcohol found in many of the fruits and vegetables such as berries and lettuce. Other significant natural sweeteners are barley malt syrup – a natural sweetener that can be used as substitute for molasses while baking; brown rice syrup, which is considered one of the healthiest natural sweeteners, as it is composed of simple sugars; date sugar, with high content of nutrients and fiber; and Vegetable Glycerin – a calorie free natural sweetener that is extracted from coconut oil. Also, a healthy natural sweetener is unfiltered honey enriched with a range of therapeutic properties. A great benefit of natural sweetener is that it is a healthy alternative over sucrose and artificial sweeteners with side-effects. Since it is minimally processed, a natural sweetener could be consumed in its natural state. Further, in contrast to intake of brown sugar and artificial sweeteners that make you drowsy, intake of natural sweeteners allows you to be more active. Above all, as it contains in it right proportion of glucose, fructose, and micro nutrients, a natural helps to control the blood sugar levels. Stevia serves as a remarkable natural sweetener. Stevia is a small shrub that is native to Paraguay’s rainforests, and is 300 to 400 times sweeter than regular sugar. It contains in it no calories, and is nutritious as well as non-toxic. In fact, it is a safe alternative for people diagnosed with diabetes and hypoglycemia. Since it has the ability to defy tooth decay and gun diseases, it serves as an excellent accompaniment in toothpastes as well as mouthwashes. It is also effective to treat a number of skin problems such as eczema, seborrhea, and dermatitis. Lowering elevated blood pressure, enhanced digestion, and weight loss management are the other obvious benefits of this natural sweetener. Agave is regarded as the healthiest among the natural sweeteners now available in the market. With right proportion of fructose, lactose, sucrose, glucose, and maltose, Agave is extracted from a succulent plant that belongs to Agavaceae plant family. Since it is a low glycemic food, it is considered an excellent alternative over sugar and honey as well as a range of artificial sweeteners such as Sucralose, aspartame, and saccharin. In addition, it contains in it high content of natural enzymes, calcium, vitamins, and iron. Weight loss management, enhanced energy levels, improved immune system and bone density, and reduced risk of diabetes and heart disorders, are the benefits of its intake, among many others. This is a natural, zero-calorie sweetener made from a plant of the Stevia family, namely, Stevia Rebaudiana. From enhanced energy levels to balanced blood sugar and insulin levels, truvia render a number of health benefits. 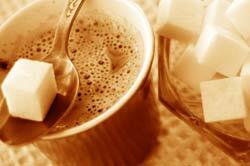 Many consider sweeteners as a boon for people with diabetes. Sweeteners enable diabetic people to try a variety of sweetened dish and beverages, from desserts and ice creams to carbonated drinks. However, not all sweeteners are suitable for diabetic people, such as Sorbitol, Dextrose, Sionon, and Sweet 'N' Low. Among the sweeteners that are recommended for diabetic people are Saccharin, Aspartame, and Thaumatin. Likewise, for best results, it would be better to add artificial sweeteners after cooking, as over heating of them may affect its sweetness and may sometimes produce a bitter taste. Equal is a branded artificial sweetener, whose prime ingredient is aspartame, which in turn is made up of two amino acids. Such leading health organizations as the American Diabetic Association and the American Medical Association consider its usage as a safe alternative over the consumption of sucrose. It is now used in more than 5000 products. Splenda is another branded artificial sweetener, whose usage is reported to be safe, as it is made from Sucralose, which is low calorie and does contain any side effect. Stevia is a 0 on the Glycemic Index and Agave is a 9. Agave contains fructose which does not create an insulin response, however it does favour fat synthesis and if Agave (or any other high fructose sweetener) is overconsumed, it leads to weight gain and abdominal obesity. Out of the sweeteners above we compared perhaps the most recommended artificial sweetener would be Stevia. Learn more about your glycemic index and find out which foods you should have.